North Korea staged a military parade in Pyongyang Thursday to mark the 70th anniversary of its armed forces, putting its intercontinental ballistic missiles on show just a day before the Winter Olympics open in the South. The nuclear-armed North is on an Olympics-linked charm offensive – sending a troupe of performers, hundreds of female cheerleaders, and the sister of leader Kim Jong Un to South Korea. But regiments of soldiers goose-stepped in formation through Kim Il Sung Square on Thursday, followed by trucks, artillery, tanks and finally four giant Hwasong-15 ICBMs – as well as a band forming the Korean word for “Victory”. 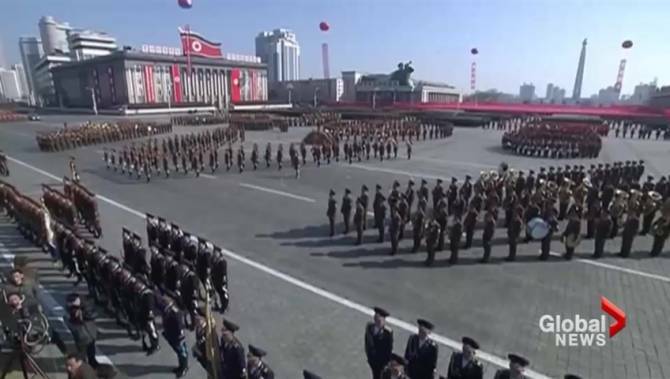 Unlike the North’s last parade in April 2017 state television did not show the event live, instead airing it hours later. Fireworks went off as leader Kim Jong Un took his place on the rostrum to watch the display, along with his wife Ri Sol Ju and ceremonial head of state Kim Yong Nam – who will head Pyongyang´s delegation to the Olympics on Friday. “We … have become capable of showcasing our stature as a world-class military power to the world,” said Kim, wearing a long black coat and black fedora. The military should remain on high alert to ensure that invaders could not violate the North’s sovereignty “even by 0.001mm”, he said. “Long live!” cried the assembled troops, their breath condensing in the subzero temperatures and some of them in tears at the sight of the leader. Pyongyang last month announced it was changing the date of its military commemoration from April 25 to February 8 – the day before the Games’ opening ceremony in Pyeongchang, just 80 kilometres south of the Demilitarized Zone (DMZ) that divides the peninsula. North Korea normally invites hundreds of foreign journalists to show off the spectacle to the world but did not do so this time, possibly an indication that it wanted to control how the display is seen – which would be in keeping with the absence of live coverage. “It looks like North Korea had potential reaction from the international community in mind and toned down the scale and message of the event a lot,” said Lim Eul-Chul, a North Korean studies professor at Kyungnam University.